Mexico and its amazing beach hotels are everyone’s favorite places to relax on a well deserved holiday, that is why our deal hunters aimed for cheap flights to Cancun this time. Fly to Cancun from Fort Lauderdale and pay $212 r/t with Spirit Airlines departing on March 11 and returning on March 18, 2014.Look for this offer via the box below and keep in mind that this is an Expadia offer we have found on Travelgrove. 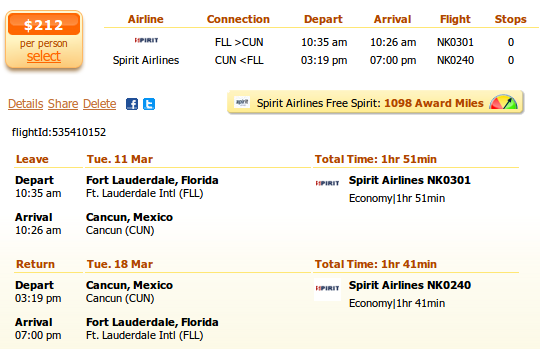 Still, make sure you check some more merchants to see if they have an even better FLL to CUN flight deal. If you check the exact flight details on the screenshot you see that you will fly from Fort Lauderdale-Hollywood International Airport (IATA code: FLL) to Cancun International Airport (CUN) in less than 2 hours both ways. It is also good to know that CUN airport is located 7.5 miles away from downtown Cancun. As you can see in the table, by booking this cheap flight with Spirit Airlines now, you can save minimum 24% compared to the prices of any other airline so you better hurry up with that booking. Note that baggage fees are pretty high with Spirit Airlines, in an attempt – they claim – to reduce fuel consumption. With higher rates they motivate passengers to pack light, and thus apparently they have saved 6 million gallons of gas last year only. Check out their baggage fees to see how can you save the most. Free Spirit, the airline’s frequent flyer program (check out our info pages for frequent flyer programs), rewards you with 1,098 award miles for booking this flight. As you would need about 20,000 award miles to get a free domestic flight with the airline, purchasing a FLL to CUN airfare can get you about 5% of that amount. This entry was posted on Wednesday, January 15th, 2014 at 6:33 am and is filed under Airfare Deals. You can follow any responses to this entry through the RSS 2.0 feed. You can leave a response, or trackback from your own site.